Heat oven to 400°F. Line cookie sheet with foil; spray with cooking spray (or use nonstick foil). In large bowl, combine all meatball ingredients until well mixed. Shape into 1 1/4-inch meatballs. On cookie sheet, place meatballs 1 inch apart. Bake 20 minutes, turning halfway through baking, until thermometer inserted in center of meatballs reads at least 165°F. Meanwhile, in 1-quart saucepan, heat all dipping sauce ingredients over low heat until sugar is dissolved; set aside. 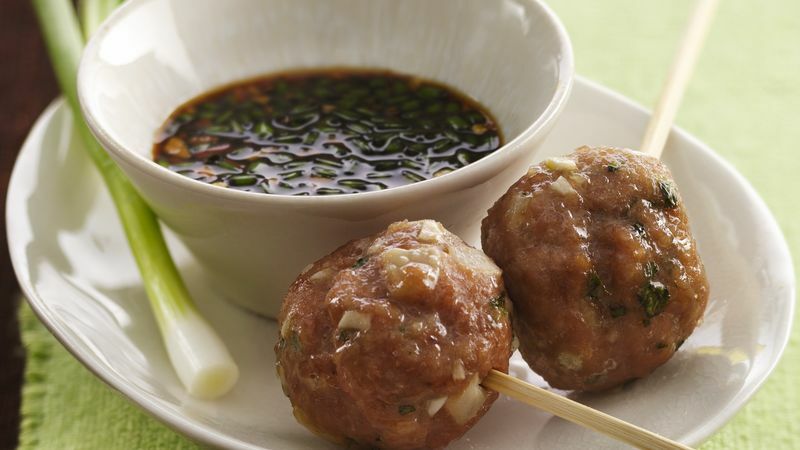 Insert bamboo skewers into cooked meatballs; place on serving plate. Serve with warm dipping sauce. Use plastic gloves when mixing ground meat mixtures with your hands to distributed ingredients evenly, while keeping your hands clean.